I had a short visit to my university on Friday. Didn't feel like putting anything too fancy on me, so I decided to go with a basic odd jacket-casual tie-jeans-casual derbies look. Could've used a more casual shirt, but I suppose this one still works here. The tie is an unlined wool tie with a very sort of shabby and rough texture - perfect for this time of the year. Pocket square is a wool silk blend with navy dots. Jeans are a bit older with a nice darker shade of blue. 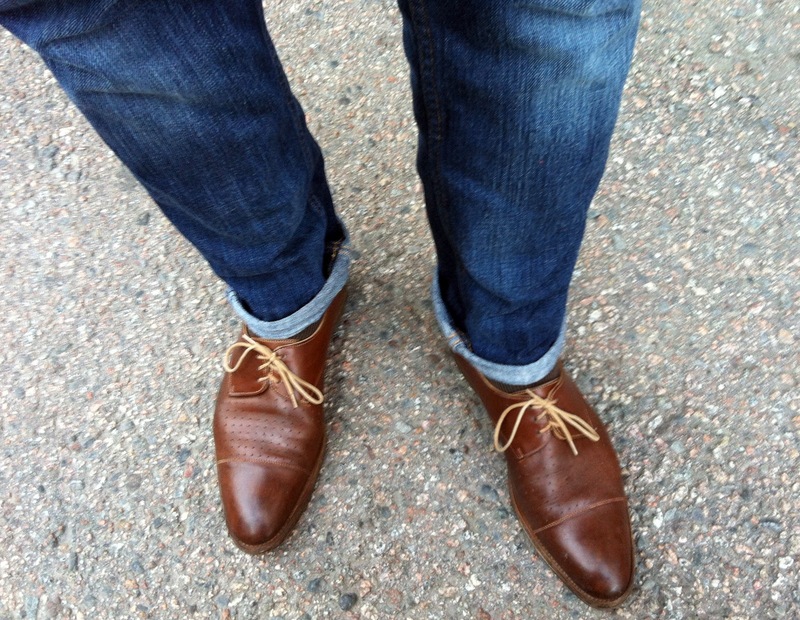 Shoes are John Lobbs, a pair that has seen a lot. I've used them to climb some cliffs in Grand Canyon, defeat the rain in Scotland and they've also stepped on some fish eyes in Shanghai. Still going strong though, with only a few battle scars to show. Tomorrow I will post the most important post so far, concerning the king of tie knots - the mighty four in hand. Check back on Sunday! Recalling my days at University in the 1970s (days of long hair & student occupations!) I recall, when I walked around my campus in a suit and bow tie (all the time) I was denounced as an Anarchist! I liked that. Heh, I can see the picture in my head. Those must've been the times. I'm really loving this jacket! is it this one:http://www.suitsupply.com/italia-light-grey-plain-c447/C447,en,pd.html?start=1&cgid=Jackets ? 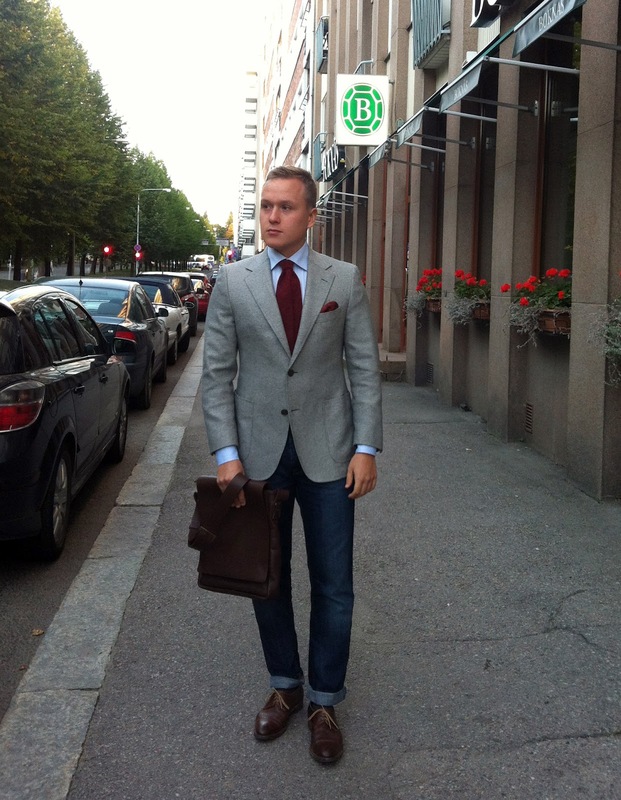 The jacket: the fabric is so nice, it puts some canali stuff I got to shame. About construction I am no expert, I will have to wear it to be able to tell about quality. The fit is pretty good as is, I have to give it a few wears to see if I want any mods done. 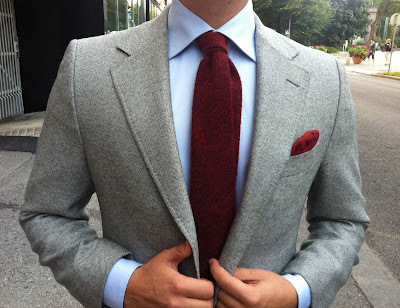 The cotton suit: this I like even more,it will allow me to create quite a lot of outfits. But this one needs to see a tailor before I can wear it. It needs a little sleeve tapering, shortening the jacket by about 2cm, letting it out a little in the waist and tapering the pants. Yes, it is that jacket. However, I bought mine already a year ago. I never really grew to like it due to the shoulders, so I had it quite heavily modified just now. Can't really recommend the Italia fit to be honest. I agree. So far I haven't really been able to tie a nice knot to this tie. It's just too slim and thick. I like the texture and the color though so I've given it a pass.